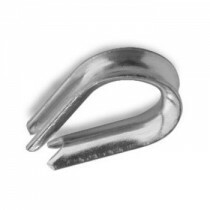 In rigging applications, stainless steel rigging thimbles are used to provide underlying support to wire rope when an eye loop is made and fastened. Commercial rigging thimbles prevent the wire rope pinching and fraying at the eye which helps keep its shape when in use and ensures that the wire rope lasts longer. 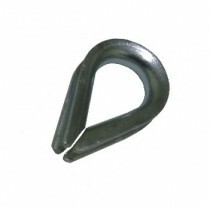 Thimbles can be complemented with wire rope clips and swages. At Keble’s Trading, we stock zinc plated thimbles, stainless steel thimbles, thimbles that comply with AS 1138-2008 and solid heart thimbles. Our zinc plated thimbles vary in sizes between 3 mm and 24 mm. Our stainless steel thimbles vary in sizes between 2 mm and 25 mm. 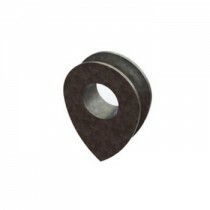 Our thimbles that conform to AS-1138-2008 (Thimble for Wire Rope standard) vary in sizes between 6 mm and 26 mm. 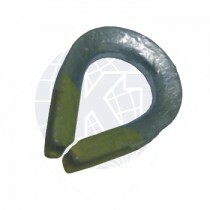 Our solid heart thimbles, which also comply with AS 1138-2008, are available for rope sizes 8 mm to 75 mm and can be crafted with a galvanised finish. We stock heavy duty stainless steel, zinc plated and galvanised thimbles that have been sourced from manufacturers that follow our strict and demanding quality requirements. Turn to Keble’s Trading for trustworthy-grade RIGGING THIMBLES. Talk to us! We speak your language! We understand your business. Call us at 1-800-067-687 or fill out the contact us form below. No inquiry is too large or too small. We would love to be of service to you today!